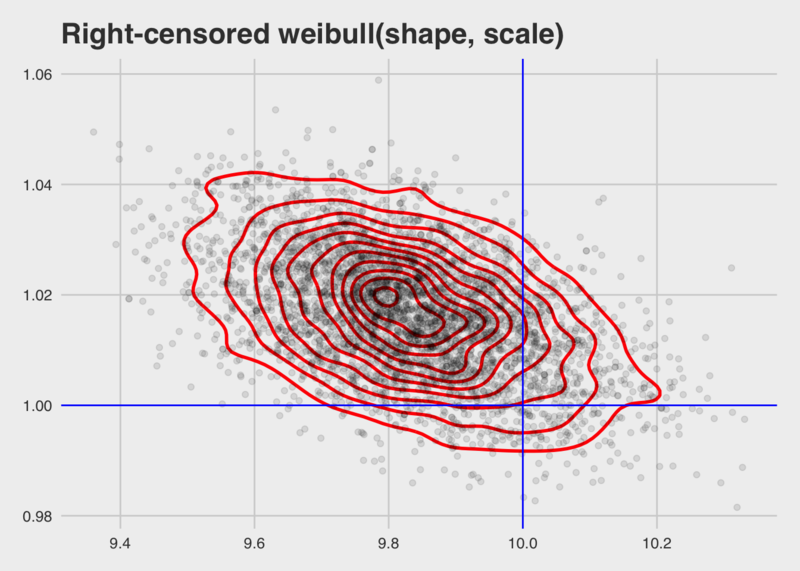 First I’ll repurpose a random right-censored weibull random number generator I wrote in a previous post. It took me a while to simplify and appreciate how to do this. The idea is that we’re drawing from two data generating processes. If the first (the censoring process) returns a randomnly generated time prior to that of a second generator, then the observation is censored otherwise we’ve observed death (conversion). Therefore we have two data generating processes that are mixing together in these cases. If censoring is random, the death time process will shine through. Information in the censoring process will influence observed times. Fit using brms, a Bayesian model ready to have prior material incorporated. # I prefer the brms style personally. 0 for death, and 1 for censored.